The story of Quasimodo, a 3-year-old dog, shows the profound compassion that humans can have for companion animals. Born in with deformed front legs, Quasi had to crawl to get around. His owner decided to leave him on the side of the road in August 2014, after which he was brought to an animal shelter. 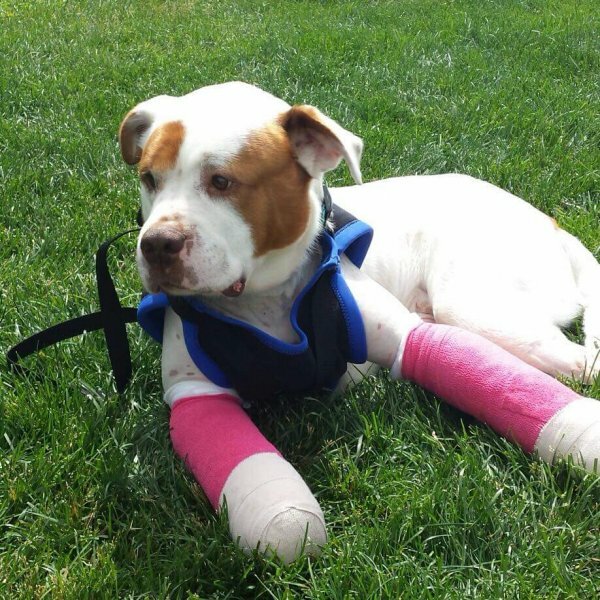 His new owner, Lianne Hughes, was fostering Quasi when she started raising money for the surgery that could correct his legs. Hughes was able to collect $5,000 from various people, including some whom she had never even met, and Quasi was taken to Ohio State's Veterinary Medical Center last fall. After six appointments, Quasi was ready to undergo the procedure in May, performed by orthopedic surgeon and associate professor Dr. Jonathan Dyce. Dyce and his team were able to devise exactly how they would perform the surgery by utilizing 3D printing technology and CT scans of Quasi's bones, leaving less things to chance during the procedure. They were able to successfully cut, realign and fuse his bones back together in the correct place. He'll be back for a follow-up in July. His story was featured by NBC New York, the Pittsburgh Post-Gazzette and The Daily Mail (UK). Check out this Facebook page that was made about Quasi's journey, "Quasimodo's Quest" and read more about our 3D printing techniques.